Synopsis: Dennis, a fifty four year old down on his luck, short-order cook encounters a stunning young female who immediately adds excitement to his mundane daily life. With a toughened exterior, yet lonely heart, he’s willing to look past her promiscuous lifestyle for the sake of maintaining a relationship with her, but their growing romance opens up old wounds for Dennis. While his new girlfriend appears too good to be true, he eventually discovers that she has ominous intentions. 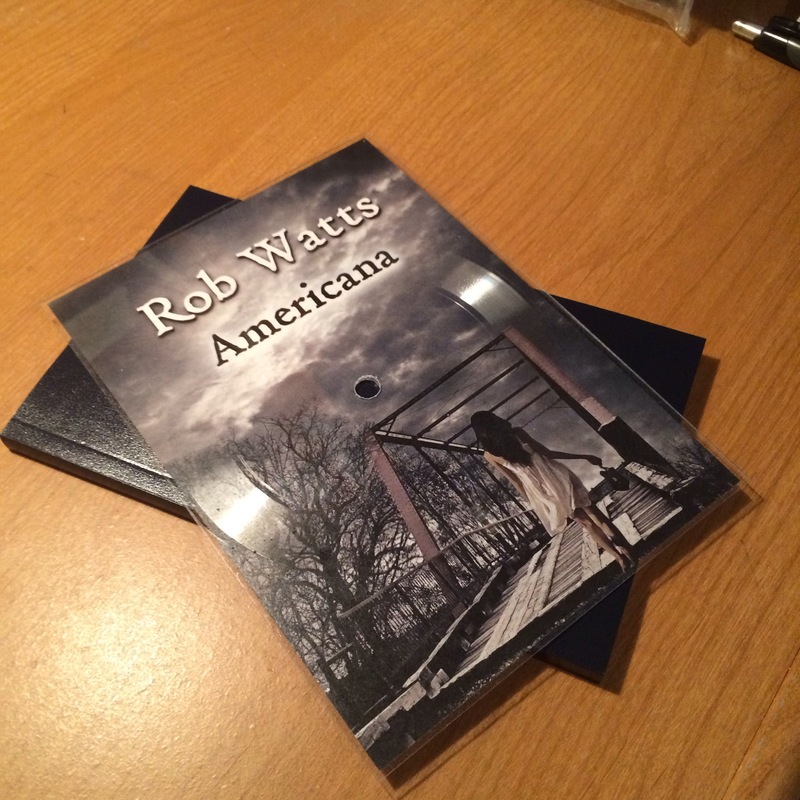 Limited Edition Print Edition is beautifully produced in leatherette binding, with a playable vinyl record book cover, featuring the song “Americana Theme” performed by Rob Watts. Limited to 50 Print Copies, signed and numbered. Available here! Robot Rock at its finest. I’m not paying it a compliment, though. Pagans in Vegas, the Toronto-based synth-pop-rock quartet lead by Broken Social Scene Alumna Emily Haynes, have released their sixth full-length album this week to much hurrah and hoopla. It’s always hard to review an album by one of your favorite bands where you just don’t feel the excitement and good energy that they once gave you. Sadly, after giving this album a few listens, I went reaching for Fantasies (2009) and Synthetica (2012), “Pagans” far-superior predecessors. While hearing Pagans in Vegas, I did find the opening track Lie, Lie, Lie to be a solid intro. Haynes trademark vocals (which is the highlight of all Metric albums) come off sweet yet venomous, as do they with Fortunes. By the time we arrive at The Shade, I feel as though I’m walking through a video arcade from hell. On Shade, which features tremendous songwriting and solid hooks, I’m distracted by the continuous Donkey Kong-like tones throughout the track. Luckily, the acoustic bonus track was included on my copy, which makes this song much more enjoyable for me. Celebrate is standout track for me as the flow between Haynes and her band mates is undeniably fluid. Where it begins to take a downturn for me is on Cascades. Not a bad track, but the band begins to sound slick and anodyne. I start hearing other bands in the music—bands that Metric inspired and laid the template for, not the other way around. Rather than recognizing hints of Depeche Mode and Lou Reed, I hear heavy-handed lifts of CHVRCHES and Shiny Toy Guns, as evident on songs such as The Other Side and Too Bad, So Sad (possibly the most annoying song on the album.) It’s the inconsistency that bothers me the most about this album. Something about it lacks focus—it just falls all over the place, whereas their previous two albums were solid with laser sharp focus. I don’t think Pagans in Vegas knows what it wants to be. Especially when one listeners to the self-indulgent two-part epic closer The Face Part one and two. By the end of the album, I’m left wondering did the entire band even perform their instruments on this album, or did they simply rely on synths? I’m hard pressed to hear any guitars or bass with any level of significance. The album isn’t a total wash in my mind. It’s just not my favorite offering from the band. While there are moments of brilliance on the album, I’m disappointed that the amount of songs that grab me only add up to an e.p.’s worth of material. 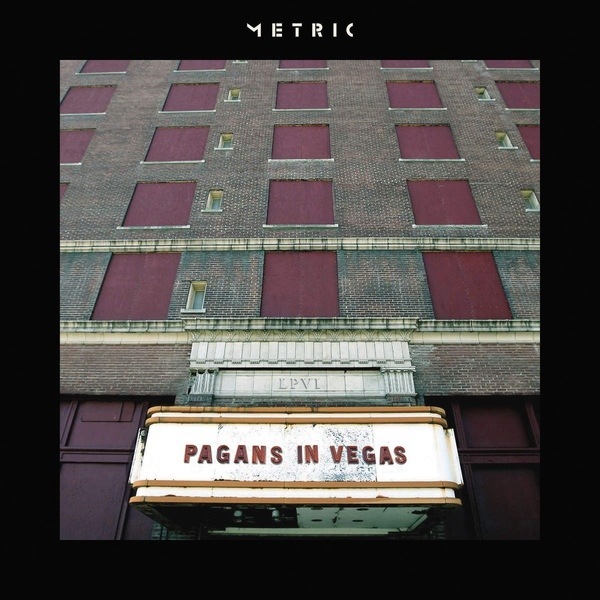 Visit I Love Metric for album details and purchasing info. 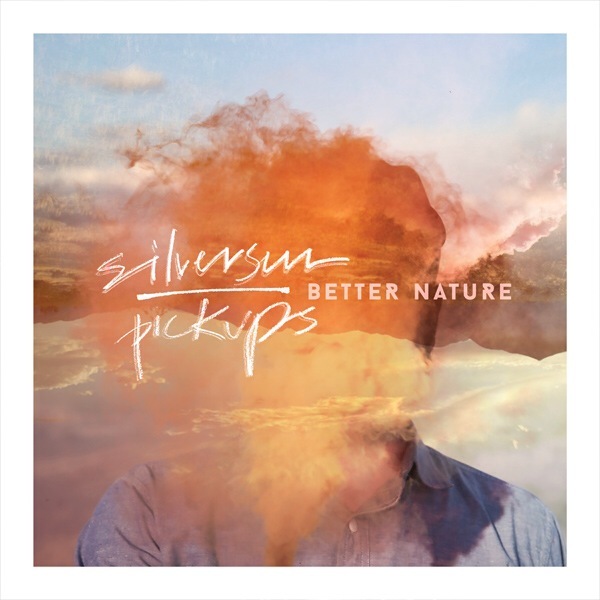 One of the coolest things about a new album by Silversun Pickups is that it reminds you of an old friend who comes to dinner—once again, with even more interesting stories to tell since last time. The Los Angeles-based quartet’s ever-expanding sound comes accross impeccably on their fourth full-length album, Better Nature which comes out on September 25th via their own New Machine Recordings. Produced once again by Jacknife Lee (who helmed their previous effort Neck of the Woods), their sprawling cinematic sound pours outward from every track, as evident from the opener Crawling (Better Nature.) Lead vocalist and guitarist Brian Aubert‘s shimmering guitar tone and unique vocal range open things up with a familiar feel but as it progresses, the album takes you to new places unlike any of the band’s previous releases. Connection and Pins and Needles pull out all the stops, with tight guitar riffs, in your face drum and bass rhythms, and of course Joe Lester‘s haunting ethereal backdrops. Friendly Fires is a slow-paced declaration, followed by lead-off single Nightlights, which is probably the closest track that bares resemblance to anything found on 2012s Neck of the Woods. 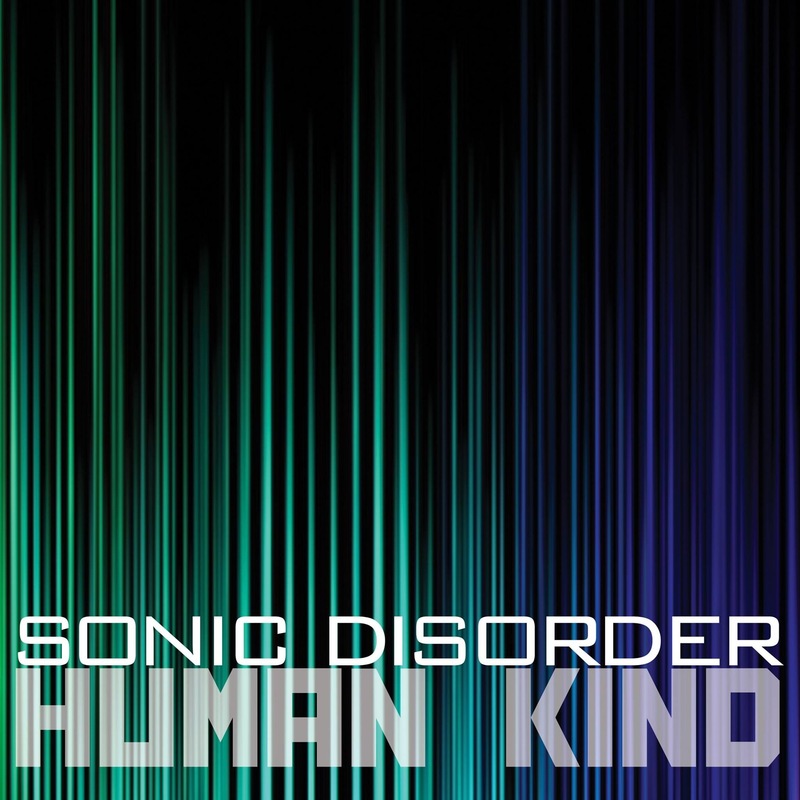 Circadian Rhythm (Last Dance), the latest single employs bassist Nikki Monninger‘s vocals as she trades verses with Aubert in a prominent manner. The track, as well as much of the album, feels like a hint of an 80s throwback—but just a hint. Tapedeck, probably the quirkiest of the collection, showcases drummer Christophen Gaunlao‘s upbeat tempos quite nicely as the song throws the listener all over the place as the track turns off every which way. Latchkey Kids falls back on familiar SSPU territory with straight-ahead musicianship, while Ragamuffin walks you down dark pathways once again with its ominous opening chords. The Wild Ones plays the listener out wonderfully with each musician utilized perfectly, which is really what we’ve come to expect from this band. With stellar production, new recording techniques, gang vocals, the implementing of Monninger’s vocals to a greater extent and an overall recharge from the band as they move forward—taking reign of their own career, this is an album worth supporting. 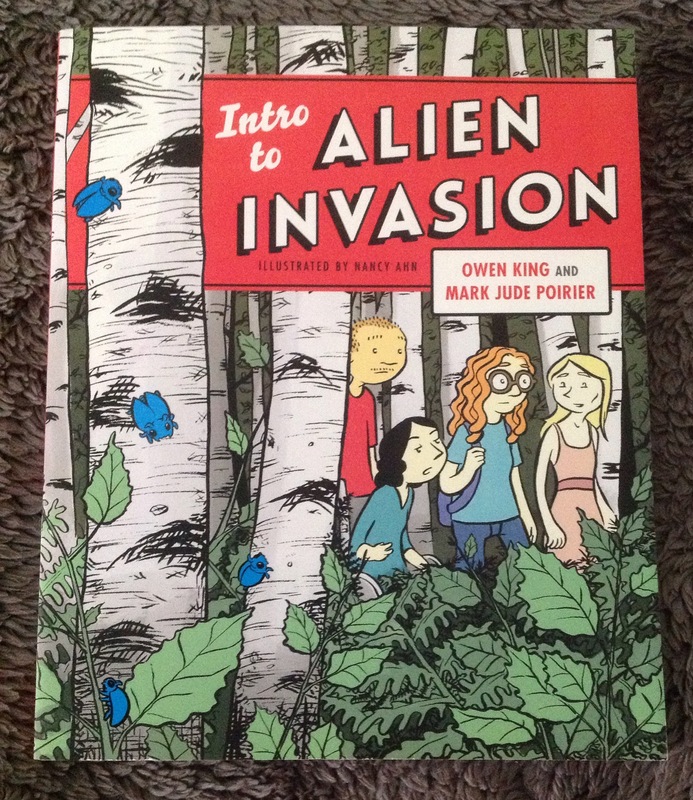 Intro to Alien Invasion by Owen King, Mark Jude Poirier and Nancy Ahn. 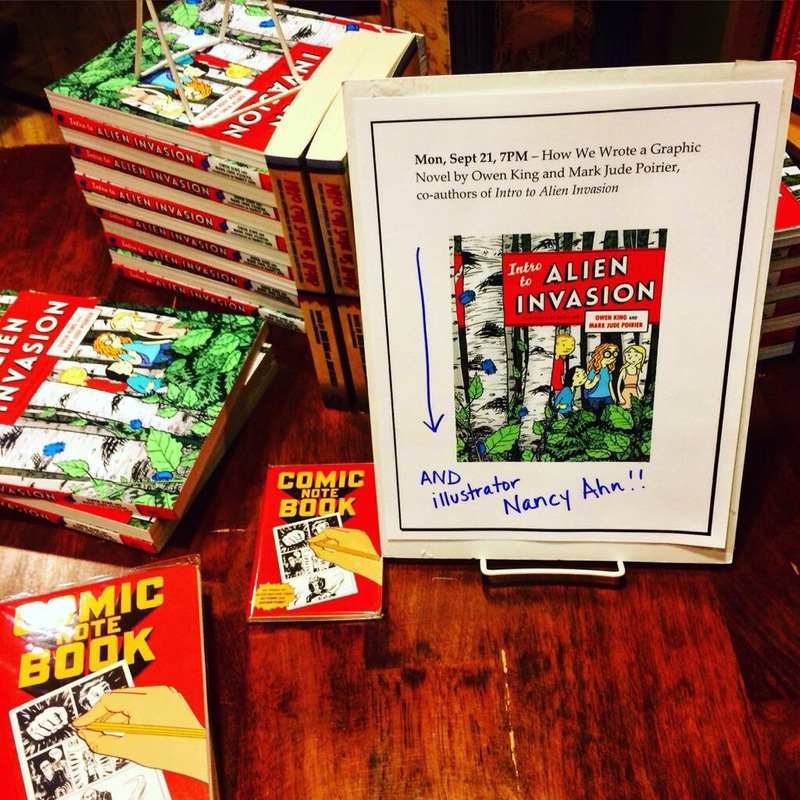 Stretching their wings as a collaborative team, novelist Owen King, novelist/screenwriter Mark Jude Poirier and illustrator Nancy Ahn bound together to create Intro to Alien Invasion, available now via Scribner. The graphic novel is a humorous tale of college campus life at the fictional Fenton College in which college student and overachiever Stacey experiences a communication collapse on her campus just as an alien invasion is happening. With her friends in tow, they must battle to survive the unannounced visit of the aliens. The story is entertaining and well-executed, while the graphic design is beautifully crafted, easily interpreted and well-paced. As far as graphic novels go, this one is perfect for gift giving, bathroom reading or just general escapism at various points of your day. 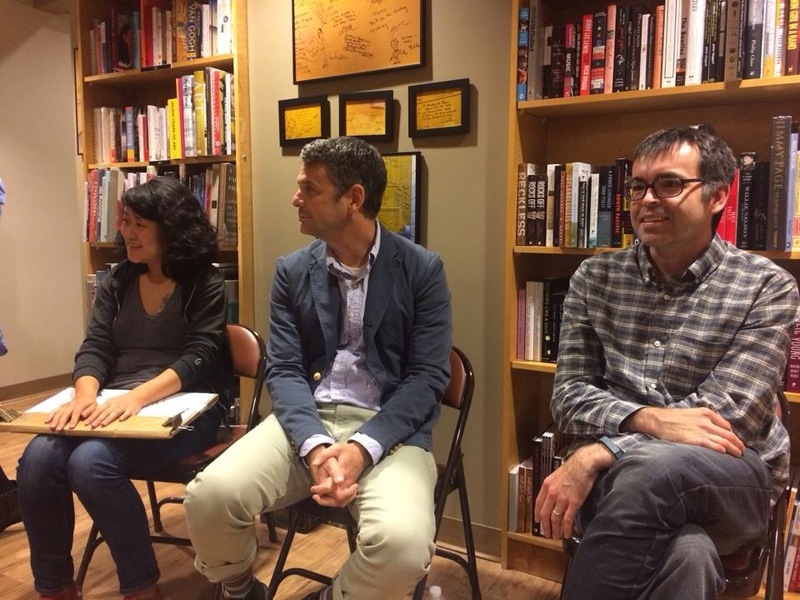 I was fortunate enough to attend a local book signing in which all three collaborators were present. Author’s Owen King and Mark Jude Poirier read humorous manifestos recalling their own fictitious (I assume) recollection of the initial pitch to produce this novel. Illustrator Nancy Ahn provided the actual storyboard stills used in the novel for viewing to anyone in attendance. The three were all very informative, entertaining and charming. The project appears to have been a great deal of fun for the collaborative. I wish them luck with it. Indie Authors: It’s Your Way or the Highway! Undoubtably, you—my indie author friends, have scowled the internet over such time in search of the magical words of wisdom from the self-appointed experts on the “proper” ways to publish and market your books. You’ve no doubt stumbled upon countless blogs that tell you YOU HAVE to be on such and such social media site. YOU HAVE to publish exclusively on Kindle. YOU HAVE to have your books available digitally accross every eBook distribution platform. YOU HAVE to design your book cover this way or that way. YOU HAVE to market yourself on Twitter between the hours of 8:43am- 11:27am. YOU HAVE to offer giveaways and special promotions, all before sundown on a certain date—and on and on and on! Look, there is a lot of great advice out there from authors who have dug through the trenches and fought the good fight in the publishing industry. I’m currently digging and fighting alongside the rest of you out there. The one thing I’ve learned along the way is that advice obtained from “experts” should be taken with a healthy dose of discretion. They don’t always have your best interest at heart, but rather your attention—especially at the end of their blog posts which direct you to the “this program is a $750.00 value but available today for just $250.00” link at the bottom of the page. My point here is to be cautious. There are many bloggers out there looking to take advantage of hopeful authors in search of professional publishing, agents, Bestseller lists, and so on. Beware of the click bait. I don’t begrudge anyone making money, but there is a fine line between legitimate author services and charlatanism. Bottom line? You yourself know what’s working and what’s not. If your marketing on social media has grown stale on Facebook, try getting aquatinted with Twitter or GoodReads. If you only want to market and make available your book to Kindle exclusively, go for it. Many indie authors have found great success by doing this. If you want to branch out and use other ebook distribution platforms, by all means, try them out—as many as you can. Kindle is perfect for genre fiction and freebies, but iBooks is popular with fans of books with illustrations, graphs, and other useful reference material. EBSCO is a new service that makes your material available to libraries. FlipKart distributes to ereaders in India. It’s worth researching the marketplace. Your particular book might have an untapped audience elsewhere in the world—places where Kindle simply isn’t reaching. Don’t be a facsimile of someone else. Take the reigns of your writing career and be an individual who stands out. Pave your own way and do things that ultimately work for YOU…not what someone else claims will work for you. You’ll save a lot of money, time and ultimately, your sanity by carving out your own niche and comfort zone in the world of independent publishing. Good Luck!! The Crooked Roads through Cedar Grove: F.A.Q. So it’s been a little over two months since my novel The Crooked Roads through Cedar Grove was released and reader response has been very favorable and encouraging. When positive feedback is received, it makes what sometimes seemed like a draining and tedious process, well-worth the time and effort. Especially in light of the fact that I have other commitments besides writing a novel. As of late, I’ve been asked by many people to discuss and bring to light some details about the book’s history, the story ideas, the inspiration behind the soundtrack and the unconventional method of release. I will attempt to answer as informatively and efficiently as possible without droning on ad nauseum. Q: How long did it take to complete the novel? A: If you factor in the time it took me write each of the short stories within the story—the full conceptual story front to back, then I could say almost five years. I had started writing volume one in the story (Huldufolk) back in 2010 and from there I’d worked on CRABAPPLES in 2012 and Left-Hand Path in late 2013. The time it spent to piece the stories together and write the bridge material and additional chapters, then the answer is roughly eight months. It took almost the same amount of time to record the book’s soundtrack. Q: How did the concept of including a soundtrack to the books come about? A: It’s another piece of the storytelling and I feel it give the story a little more depth and contrast. Plus, there aren’t many authors doing what I do—adding a listening element to their story. I like going the extra mile and giving the reader a unique experience for the money they’re spending. Q: What happened to Huldufolk? Why wasn’t that story included in The Crooked Roads through Cedar Grove? A: Simply put, it no longer worked within the context of the novel. I love Huldufolk and it’s one of my favorite stories, but as much as I tried to make it work within the novel, at the end of the day it had to be eliminated. It was an early decision and I believe it was the correct one. As much as I wanted to make it work, I quickly realized that a young couple coming home from a haunted honeymoon in Iceland wasn’t going to flow well with the accompanying story lines. A writer needs the ability to self-edit and self-govern his or her writing, and this was a case where I did just that. Instead of completely eliminating the story entirely, I re-wrote the characters and settings to accommodate the rest of the content within the novel. Q: Did you end the story with the intention of writing a sequel? A: I can certainly see how one could draw that conclusion, but right now it’s the furthest thing from my mind. There are characters in the book that I am very fond of and have some passing thoughts as to where I could take them in the future, but that will be further down the line. If and when, they wouldn’t be direct sequels—the type that pick up right where the action from the previous book left off. If I revisit a storyline from the Crooked Roads, it will most likely be a standalone story with some relation to the aforementioned novel. There are other projects I’m working on in the meantime which will begin to materialize shortly after the new year. 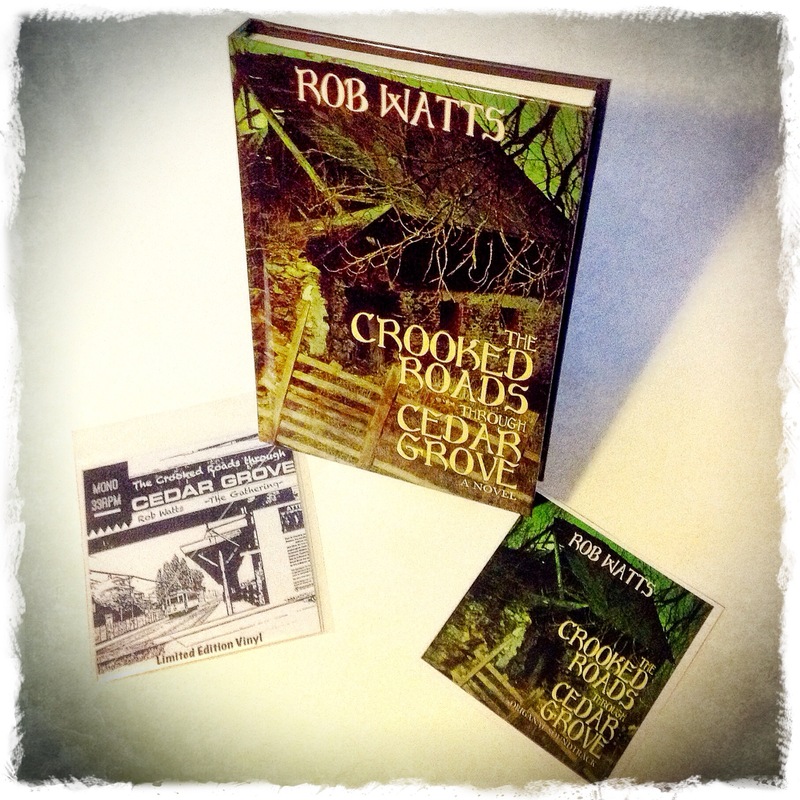 Q: Will you be releasing The Crooked Roads through Cedar Grove in paperback edition? A: Yes, sometime in 2016 when we’ve exhausted the hardcover sales. However, like most of my work, it will most likely be a limited number run. 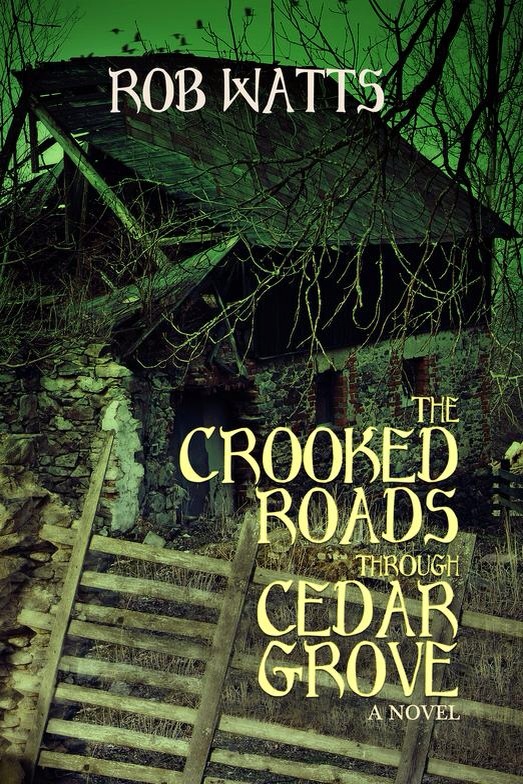 Q: Who is your cover artist for The Crooked Roads through Cedar Grove? A: Nicolene Lorette Design. One of the best in the business and easy to work with. Q: Are vinyl copies of The Gathering from the book’s soundtrack still available? 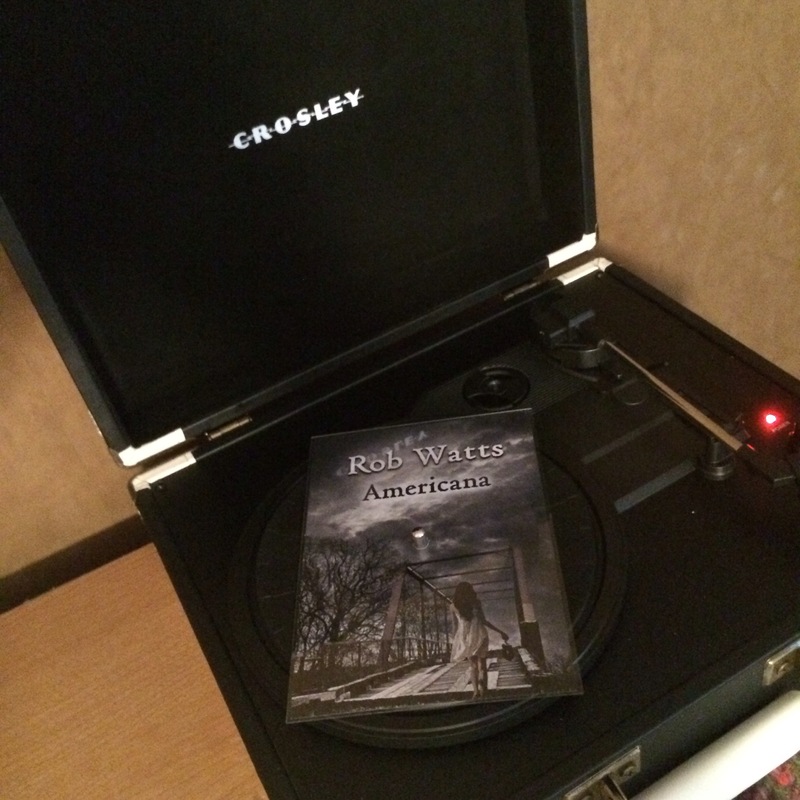 A: The vinyl record of The Gathering was offered for those who’d pre-ordered the book back in June. With that said, copies are dwindling and for now, are only available at my table signings at the remaining signing dates I have scheduled. They are highly limited edition as each vinyl album was hand crafted—not mass produced, and once they are gone, they are gone forever. Q: Where did you draw inspiration from when writing The Crooked Roads? Where were you getting your ideas? A: I drew inspiration from the fact that there are a lot of evil spirited people around us and the fact that a lot of people are idiots. One needs not to look much further than the local news every evening to realize that we are living amongst monsters in our neighborhoods. They hide in plain sight and blend into society quite nicely. 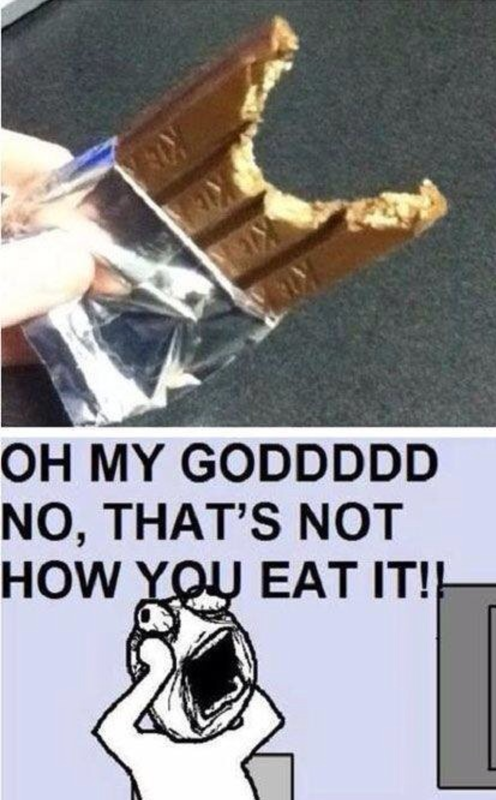 That is horror in its purest form—in my mind at least. 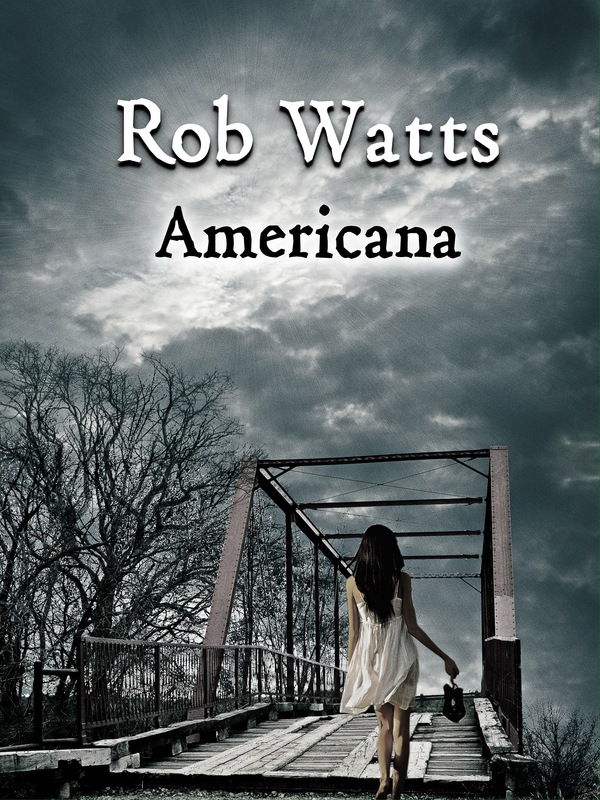 Vampires, zombies, whathaveyou—those are great characters for escapism. But what about the person who stands before you and poses as a friend, a confidant, a respectable police officer, et cetera—but turns out to be someone of the opposite? Those are the type of people I wrote about, and although my story is a bit sensationalized, I think it captures the true essence of today’s deteriorating society. Q: What is the genre of the book? What’s an appropriate age group for the story? A: it weighs heavily in the genre of Suspense and Thriller. There are elements of Mystery as well. Age 17 and up is the popular consensus, but I’m not the parent so it would be better left to a parent’s discression. Purchase your copy of The Crooked Roads through Cedar Grove directly at Ocean View Press. Download on Amazon Kindle.